Walking through four Pythons as a man! God said He would demonstrate everything He was teaching us. Concerning the Python Spirit, He would teach us one aspect, such as, “he is a strongman,” and then He would demonstrate that aspect by giving us immediate success with a situation where it had previously eluded us. Great success has been experienced concerning many people praying against Python. We have had people inform us that they actually felt the spirit leave their mind. On the other hand we have experienced situations where praying for people had little or no effect. The following will give you some insight into why. All this started when a pastor asked us to pray for a person I'll call "Sue," concerning Python. There was much travail, more than I have ever experienced in praying for anyone concerning this spirit. I did not understand why all the travail until the pastor reported what happened as they were going through deliverance. This was quite sometime after we had prayed. The following is taken from that pastor's report to me. I have constructed a picture of the Courts of Heaven symbolically for you to see. The pool of water represents one's whole body, as in Luke 11:36. You will notice a dark spot in the picture with Python out of the pool, but he is wanting to get in. You will see some open doors that let Python enter. You will also see some dark spots that allow him to stay. Notice that as the dark spots are dealt with the Python comes out, little by little. As soon as the pastor commanded Python to come out, Sue was immediately in the Spirit and underwater. Sue felt like she was drowning. She was in the lake where Python swims and saw Python grasping at this thing down in the water that looked like a bubble. It had white things in it. They would command Python to come out and there was movement but it would never leave, always staying within reach of this bubble looking thing. They asked the Lord, "What is giving it this right to stay there?" The Lord said, “You're casting your pearls before swine” (un regenerated souls). Suddenly a bucket of pearls was being dumped towards Sue. These pearls represent revelations (the white things in the bubble) from God, things of God that Sue had spoken, not just shared, with unregenerate souls. Some of this had to do with being out of time with God instead of giving these pearls only when the Lord wanted them given. Sue now reports to the pastor that her head is starting to come out of the water, saying, “Python is quick, it's coming right up at me.” This particular picture does not surprise me at all. I have seen Python attack during deliverance; it's all done in the mind. It can in certain circumstances stop deliverance! At this point the Lord took Sue back to when she was a little girl about 7-9 years old. He showed family situations where one person would get mad at another and finally blame the situation on God, where they were rejecting the wisdom of God and the understanding of God. The pastor's words: "So if you get mad at God - it seems like getting mad at God, (and this came up in a few scenarios) gives Python a stronghold in your life: the religious spirit, because it seems like if you get mad at God you are in religion. It's hard to explain." Then Sue's head was out of the water, showing progress was being made. Sue's head was out but the Python wasn't out, and she reported layers in the water. Now Sue is about 7-9 years old again and seeing herself angry at the the Lord because of the things that have happened to her family. The pastor asked Jesus to talk to the child, as the child had a grievance with Him. Instantly Jesus was with the child and Sue was telling the Lord that she was grieved and angry about what happened with the families and all the people that were going to hell. The Lord said, "Well, I hurt for them too. I feel for them." This didn't satisfy Sue and she turned away mad. The Lord never moved, He stayed right where He was. The pastor said, Lord, what is it that is keeping her from freedom? The Lord instantly took Sue back to the grandmother again. She was 7-9 years old again. The grandmother would tell her things; she was very religious, a godly woman, but she had these hurts about families and God letting them go to hell. Sue believed it because her grandmother was a godly woman. The pastor said, "Here's one of the keys I've been noticing: if you believe a non-truth about God it gives the Python rights." Now Sue was out of the water and on the shore. She reported that Python was still in the water but sticking his head out. Suddenly Python began screaming, "I have rights, I have rights!" The next thing Sue said was this, "I see this odd being walking on this white platform." The pastor said, "We're in the Courts of Heaven. That means that white means righteousness." Sue. said, "It looks like he's looking for papers for something. The pastor said, "He's looking for the rights of what he's claiming." Lord, "What are the rights that he has? We want to repent and make it right." Instantly Sue is with another grandmother. She sees herself about three years old and in a bathtub. The other grandmother is telling Sue something that again was not quite right, about hurts in her heart concerning God and other people or situations. Sue believed it because this grandmother was a godly woman also. The pastor reported that these words were actually spirits of inheritance. By these false words (beliefs) it transferred these spirits to Sue. It all comes through a belief of a non-truth. (It should be noted here that a three year old would not really understand all of this, yet the transfer occurred. On this site I have already testified of the haughty spirit jumping on me from a man sitting beside me in Pizza Hut. Just before this experience of God bringing things together in my mind, I had found my original notes of the Pizza Hut experience. On those papers I had recorded that the Lord had told me that if I had accepted the thoughts from the haughty spirit, I would have taken on the haughty spirit myself. I would have taken on one of those dark spots as revealed in this article. Now Sue was out of the water and Python started coming out of the water. As he was coming out of the water it was turning clear. Sue said, "He was turning the water dark." She reported, "His head was like a dinosaur and he has teeth." He was coming out but he was looking down in the corner of the pool where there was a dark part. So they immediately asked, "Justice, what is that in the corner of the pool that's dark; what are the rights, that Sue may repent? Sue moved closer to the spot in the corner and saw that it was blood and pieces of brown paper. The blood meant family ties; they understood that. It was the beliefs Sue had about family ties, and families that caused aught in her heart against God again. She repented and broke the curse of an inherited spirit from both grandmothers. In doing this, it cleared up the water. But Sue knew Python wasn't gone. She asked the Justice, "What other rights does Python have? I want to repent!" Then the Lord took Sue down into the water to take a real close look. She said the pool water looked like it was illuminated inside with a light bulb. However, it had a cloudiness to it at the same time. Floating in the water were all these bits of something. The Lord said, "Those are non-truths that you have spoken." Then the Lord showed Sue again at the age of 7-9. She began repenting of the thoughts of all the words with non-truth, asking for forgiveness and that they'd all be replaced. Sue renounced them, broke them, and did this basically on every single thing the Lord was revealing, asking for the "Spirit of truth" to replace all of them with truth. Then they all turned into bubbles and they were all coming up to the surface, popping and disappearing. This went on for a while. Then the Lord put Sue in the pool and she said, "I'm in the pool but I'm a miniature person." The pastor said, "No, the reason the Python took up all this pool is because he is extremely large and you are the correct size in relationship to the pool. She looked like a miniature person in this big ocean of water. Sue said she could swim real fast and was enjoying the moment. Then they asked if there was anything else in the Courts of Heaven that was giving Python a right. Sue said, "All of a sudden I took off right out of the courtroom and right up into the sky at an extremely high rate of speed. Everything turned small below. She was now back where they had started." We see from this account that the Holy Spirit was doing some educational work. The pastor told me the key in all of the situations except one, was accepting non-truth as truth! I have known for some time that getting rid of the lies is a big step in getting rid of the spirit. This relates to the Lord telling me it takes a Flow Chart to get rid of Python because the Lord can reveal untruths in a person's Flow Chart. The pastor and I talked about the spot in the corner of the pool. Let's look at a picture, just to realize a few things. Python was driven out of the pool little by little by replacing untruths with truth. It is now looking at one spot in the corner. Python wanted in but the spot was not big enough for him to do so. The python will then be wanting to get more untruth back into the pool so the darkness expands enough for him to get back in the pool. Once this happens the whole pool suddenly goes dark, he is in control, and the person can't see truth although the person doesn't know this. They don't know Python is living their life. Remember the lady who, after her deliverance, wanted to write a book entitled, "Who's living your life?" That's how serious this is. In this deliverance the spot in the corner was taken care of but that does not mean a spot of untruth could not re-enter the pool again. I will give an account of this actually happening to a person. This picture can be seen because of our Corporate Flow Chart. The main thing about a Flow Chart of the "things of the Spirit" in this situation is that it can be very instrumental in exposing certain untruths in the pool. The untruths can be replaced with truth, step by step, producing deliverance, little by little, similar to what's presented in this account of deliverance. Truth must replace the unknown untruths. Let it be known here that Python can work/control/affect a corporate body as a whole, as well as individually. 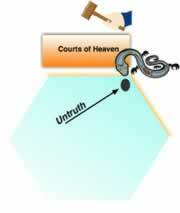 Before we leave this Courts of Heaven section I should mention giving out the pearls to unregenerate souls. What an opening! The pastor told me the Lord had dealt with him some before about this. He just didn't realize how serious it is!